Hotel Care - Toodaloo Pest Control - Call Us Now! Keeping hotels in Canada Bed Bug free can be a challenge. Most cities in Canada can be highly visited, so hotels and guest occupancy in general are always at a high. Early Identification, Prevention Programs, Bed Bug Treatment Guidelines and most importantly Discretion are 4 factors required to be successful in the war on Bed Bugs in Canadian hotels. Toodaloo Pest and Wildlife Control has a team that is dedicated to Bed Bug Management in Hotels, Rooming Houses and Multi Unit Dwellings throughout Canada. The challenge with Bed Bugs and hotels in general is turnover. Realistically, the hotel room is receiving new occupants every other day, which makes it difficult to know who is bringing in what and where? Toodaloo Pest and Wildlife Control and the Hotel will work together to establish protocols for inspection frequency and include and educate the hotel staff on Bed Bugs in general. Monitoring tools used discretely and properly can be monitored by Toodaloo Pest and Wildlife Control as well as Hotel staff during regular room changes. Full unit inspections are also suggested, on a regular rotation, which allows Toodaloo technicians full access for inspection. Knowledge is power. Knowing exactly what to look for within the room is crucial. Bed Bug spotting, casings, excrement etc. are all of the signs of activity that need to be looked at. In addition to these signs of activity is location. Knowing exactly WHERE to look is equally as important. 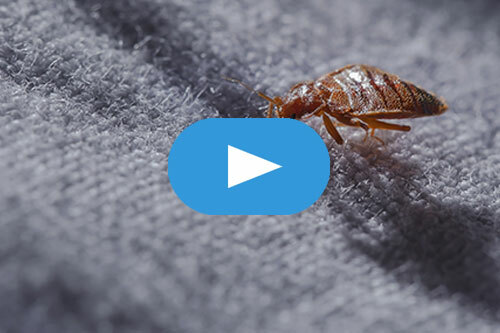 Bed Bug treatments in hotel rooms play an important role in the day to day activity, as keeping an establishment pest free, especially from Bed Bugs is crucial. Hotels need to keep guests happy and satisfied so when they walk away from their stay, they can say they had a great experience. Toodaloo Pest and Wildlife Control uses multiple treatment methods to assure that if Bed Bugs do turn up “positive” in a room, they will be eliminated quickly and effectively. Using different treatment methods such as steam, vacuum, aerosols, residuals etc. combined with our unique application methods allows us to eliminate Bed Bug activity. Discretion is a must. If requested, our technicians will arrive out of uniform and they will NEVER use the word “Bed Bug” in any public area. We usually refer to our service as “inspecting the carpet” or something of the sort allowing further discretion. Toodaloo Pest and Wildlife Control also offers all of our Hotels, Rooming Houses and Multi Unit Dwellings throughout the Whistler area, education sessions for the maintenance staff and management on Bed Bug control in their establishment. It usually ranges from 30-60 minutes, touching on Inspections, Signs of Activity, Do’s and Don’ts etc. For further information or to book an inspection/service call, please call our office at 1-844-TOODALOO.